Do USB ThumbDrives Ever Die? 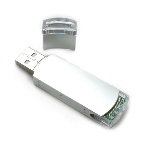 Can you trust USB thumbdrives to always keep important files safe?–PC Pitstop. Do USB Thumb Drives Ever Die? leo notenboom usb drives. permalink. but it can be assumed, that USB3-Sticks are surer due to their much more power consumption, but I have lost trust in all USB-sticks with regard to data security. yes, I have removed all USB-drives from my computers, except very short term storage. It is crazy to have Gigabyte USB-Sticks and some files loose information that can last months until one notices it. In the meantime many other files are changed and restorage is a matter of hours of work. This is not bearable for a data processing, where people have Terabytes of data and must look for every single file if it is still correct.